It�s welcome news that RCA Red Seal has got around to present Heifetz�s 1961-62 concerto haul with Malcolm Sargent on SACD. I�ve forgotten now quite how many times I�ve reviewed his Scottish Fantasy � but the last time was in the context of BMG�s Heifetz in Performance DVD and CD set (see review). I�ve always been partial to the Perlman recording of this for the sumptuous soloist and for the sympathetic conducting, but in my experience the conductor who gets the most out of the orchestral part is Kurt Masur for Accardo � his is a stunning example of warmth and clarity (see review). He certainly gets more out of it than Sargent, who is by no means routine but who cedes ground at most important points. 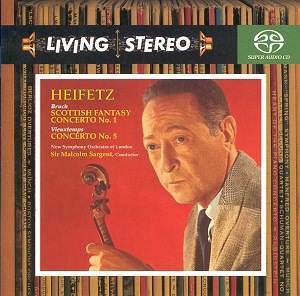 Steinberg was the conductor in Heifetz�s only other commercial recording of the work (now on Naxos - see review), a decade earlier. I happen to prefer the later one with Sargent. Sargent made two recordings of the Bruch G minor with Heifetz, a decade apart. By 1962 the trademark Heifetz devices were firmly in place and little that he does will surprise admirers. That said whilst this is glamorous and succulent playing there are times when some of his rubati, especially in the opening movement, do sound a touch forced. Overall he seems more temperamentally suited to the Fantasy. The third recording is the note-spinning but very enjoyable Vieuxtemps A minor. This is one the most lop sided concertos in the violin book with a twelve minute opening movement and a finale that takes, here, barely a minute. . Admittedly the finale was tacked on ... but still. Sargent and Heifetz had originally recorded it on 78s back in 1947. Refined elegance is the watchword � the Gallic care for line and elegance ensure that we don�t get unnecessary fireworks even in the first movement cadenza. Heifetz�s sustenance of legato in the Adagio is a wondrous thing. There has been some tape deterioration, a feature I�ve noticed on a number of these revivified SACDs of classic Red Seals. Little blips on the master tape are noticeable at high level, as is a degree of hiss. However those who failed to collect the Heifetz Edition have now gradually had the opportunity to add things courtesy of a number of companies and this is just such an opportunity. The same line up of concertos was also issued on a 1990 BMG cheapie and it had the same running order.